It is always important to ensure who ever is packing your goods into shipping containers knows how to correctly stow them. 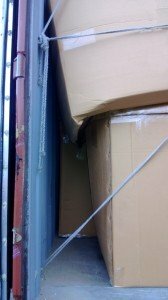 We see many containers where the goods packaging has been damaged and in some cases the actual goods as well. Damage to the cartons is particularly important if they are going straight out to the end buyer. Nobody likes receiving boxes which are squashed, torn or generally misshapen. Often the issues we see could have been avoided with a little care. As seen in the photo below. The box on top of the other box probably was fine when initially packed in, but due to not being stacked directly on top of the other one and combined with being some space inside the box. As the container has move it resulted in the box settling and distorting. All because a little care was not taken when initially loaded.